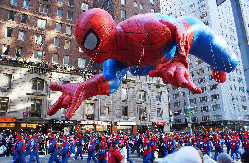 The first Macy’s Thanksgiving Day Parade took place in 1924 and at the time, Macy employees marched down 34th St. dressed in vibrant, colorful costumes along with floats, marching bands, and live animals that were borrowed from Central Park Zoo. Today, the main attractions are the enormous floating cartoon character balloons and the exclusive foot traffic. From the very first parade in 1924 and every parade thereafter, Santa Claus has been welcomed into Herald Square at the end of the parade, directly in front of the Macy’s flagship store, marking the beginning of the holiday season. This is an absolute must for anybody with children. Santa Claus is coming to town… And he’s absolutely everywhere. Some popular places to visit Santa would be Macy’s, Bloomingdale’s, Rockefeller Center, Brookfield Place, and the New York City Fire Museum. This is a winter tradition for many New Yorkers and tourists. Known for its romantic backdrop, Wollman Rink, located in Central Park, allows you to skate through traffic against the famous New York skyline, under its twinkling lights, so it’s the perfect place for a date night with your sweetie. If you are a fan of stage shows, this is the option for you. The Radio City Christmas Spectacular is an annual holiday musical stage show that spans back to 1933 and is performed by the beautiful, talented, and high-kicking Radio City Rockettes at the Radio City Music Hall. The show includes several numbers, all emulating the spirit of Christmas. This is another very popular annual Christmas tradition that dates back to 1933. 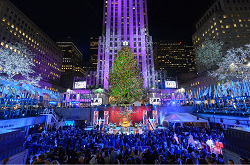 The Rockefeller Center Christmas tree is a very large Christmas tree, typically a 69 to 100 foot tall Norway Spruce, placed in Rockefeller Center in Midtown Manhattan. The tree is erected in mid-November, but the tree lighting takes place the Wednesday following Thanksgiving and it is a huge event with performances by many famous musicians. 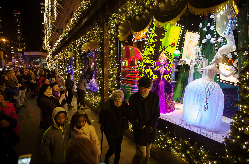 The major department stores of 5th Ave. compete with each other to create the best, most creative and magical holiday window displays and they are a sight to see. Popular stores include Barney’s, Bergdorf Goodman, Macy’s, Bloomingdale’s, Saks Fifth Avenue, and Tiffany & Co, to name a few. Just make sure to dress warmly and wear comfortable shoes because you will be doing some walking and waiting in lines. 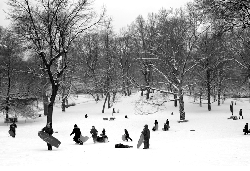 Head to one of the local parks to enjoy some sledding in the city or have a snowball fight. Central Park has to offer Pilgrim Hill, which is steep and great for sledding, but it is very popular and can get crowded. An alternative option in Central Park would be Cedar Hill, which is not as busy, but it is also not as steep. Prospect Park in Brooklyn is another great option, as it features many rolling hills. If sledding is not your thing, you can start a snow fight or build a snowman with friends and family. 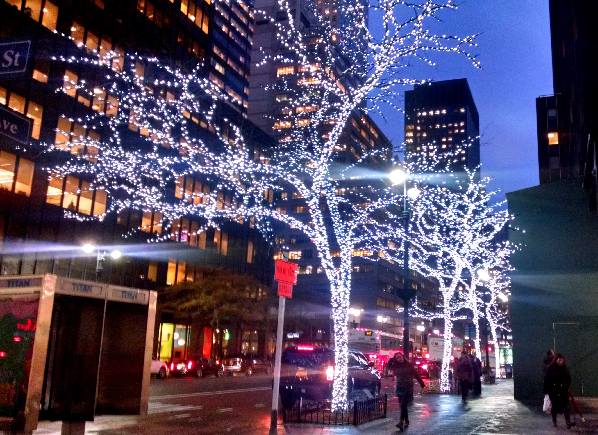 If you are a fan of holiday lights, this would be the best option for you. 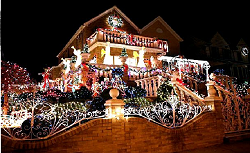 Every year, the residents in the neighborhood of Dyker Heights in Brooklyn decorate their homes in festive, extravagant, over the top holiday light displays, trying to outdo one another. If you’re feeling a little naughty this season, then this would be the event for you! 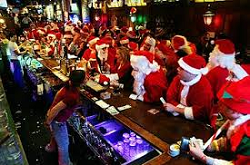 SantaCon is an annual holiday mass gathering and pub crawl where people dressed as Santa Claus or other Christmas-related characters and parade around the city from bar to bar to get their drink on. The event this year is on December 14th. 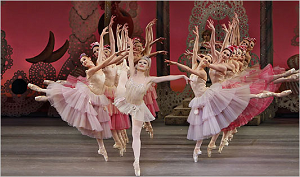 If you want something a little more classy, George Balanchine’s The Nutcracker, performed by the New York City Ballet and scored by Tschaikovsky, would be the option for you. The Nutcracker is a holiday classic and the ballet takes you on a fantastical and heartwarming adventure through the heroine’s eyes to the wonderful land made entirely of treats. 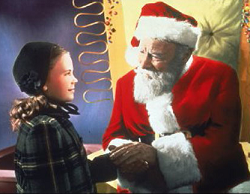 Adults and children alike can immerse themselves in the holiday story and escape their reality for the moment.